The inspiration for this painting sprang from Dr. Ramsey (FHCRC) during a meeting concerning health disparities in the Alaska Native/Native American Communities in Seattle WA. Upon securing a small grant, together we decided to focus our efforts on smoking cessation and how we could express the statistical data in a culturally acceptable manner. The story of Octopus Woman and Crow discusses what can happen if one does not heed the advice of Elders. The image created illustrates 25 crows. The crows are heavy smokers who quit. 23 crows would not get cancer, one (yellow) develops lung cancer, and one other (blue) escapes the tentacle of cancer by quitting. Octopus is cancer. The original painting is now in the permanent collection of the National Institutes of Health (NIH) at the National Libraries of Medicine (NLM) located in Bethesda MD. The original painting is now in the permanent collection of the National Institutes of Health (NIH) at the National Libraries of Medicine (NLM) located in Bethesda MD. Part of a national exhibition on Native Perspectives of Healing. The inspiration for this painting arose from the incredible work and dedication of the Spirit of Eagles staff. Special thank you's go to Dr. Judith Kaur (Choctaw) and Paulette A. Baukol for their enthusiasm. 1) The Four colors of man at the top are expressed in the form of pictograph eagles, honoring the wisdom of all Elders. 2) The blue flowers in the border illustrate the many plant medicines Creator has left for man to heal the community. 3) The light blue eagles represent the positive influence the Spirit of Eagles has from infancy to adulthood. 4) The group of wigwams at the bottom show the importance of community commitment and collaboration, the foundation for healthy living. The many Cancer Warriors whose names are listed on the back of this painting. Also, the Coast Salish People, for their wonderful stories which healed me in spirit, the many Ancestors whose inspiration was irreplaceable and Creator who brought all of us together to create this beautiful image. I honor all of you with this painting, and wish to expand this important effort in the future with four button blankets that could be donated to clinics or medical centers. 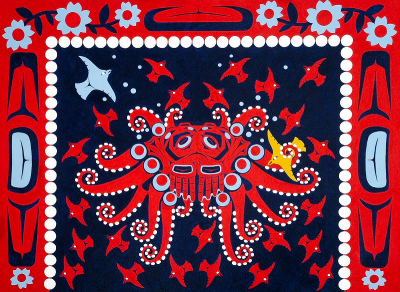 To Johnny Moses, Tulalip - Native American raised in the remote Nuu-chah-nulth village of Ohiat on the west coast of Vancouver Island, B.C., Canada, who had recorded the story of Octopus & Crow and made this available to the public. To the Mc Neil family, Tlingit Tribe, Eagle Moiety, Killer Whale Clan of Alaska and the Cloud family, Winnebago Tribe of Nebraska, Bird Clan who let me view their heirloom button blankets and who encouraged the making of the this art piece and generously gave cultural advice. 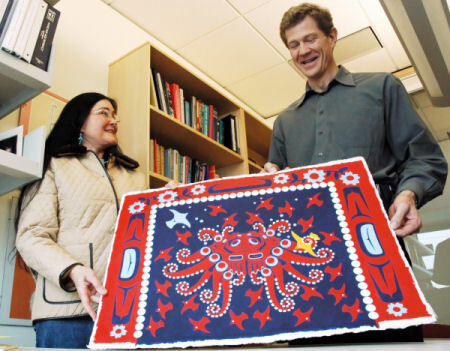 To Scott Ramsey, MD, Fred Hutchinson Cancer Research Center who envisioned the integration of native art to express cancer statistics, plus his assistant Sara Jones. To Marvin Oliver, Quinault and Isleta-Pueblo heritage, who taught me how to draw ovid designs in a class at the University of Washington, Seattle. 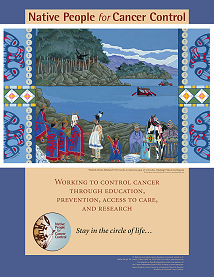 All the Staff associated with Native People for Cancer Control project and the grant reviewers who had faith in this unique project. With the encouragement of positive feedback in regards to the Octopus Woman painting a button blanket was born. Button blankets are very sacred articles. I had wished to create a button blanket for many many years, but never had a good reason to do so. With a gentle push from my dear Tlingit and Winnebago friends this button blanket arrived. The blanket was carefully reviewed by Tlingit family members from start to finish. This piece of art now resides in the Eiteljorg Museum of American Indian Art located in Indianapolis IN. Blanket: 56" x 56" - Heavy melton wool, natural shell buttons in 3 sizes, hand and machine stitching. This robe is now part of the permanent collection at the Eiteljorg Museum of the American Indian, Indianapolis IN. After attending the Spirit of Eagles conference convened by the Mayo Clinic in Minneapolis MN I was very surprised as to the devastating impact HPV infections had on both young men and women. 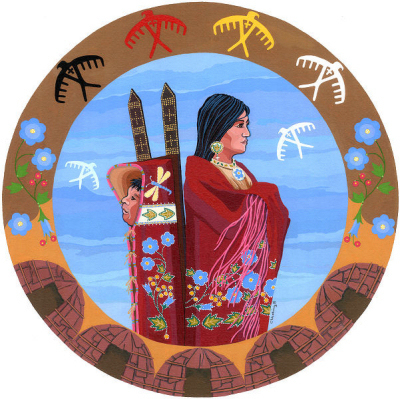 The infection rate for Native Women was staggering. I thought so much about the role of women and how our bodies deliver the future into the world. We Hold the Future is a wearing blanket that speaks of the responsibility women naturally carry as Grandmothers, Aunties, Sisters, Nieces and Daughters. 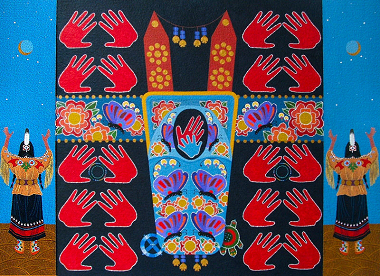 The red hand in the cradle board represents choices a mother makes touches her baby. I loved the painting "We Hold the Future, so it was a natural fit to transform the design into a traditional wearing blanket. 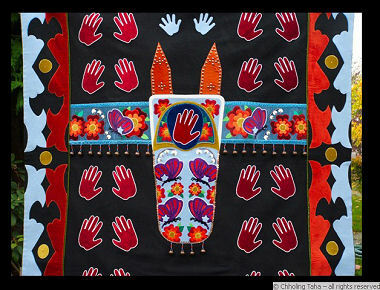 The blanket won First Place Award at the Eiteljorg Annual Indian Market in 2008! This lovely robe will be part of a travelling exhibit here in Minnesota beginning Nov 4th 2011 until June 2012. Use of my artwork to encourage healthy lifestyles. My painting 'Potlatch, We are All Related' illustrates the power of communication. 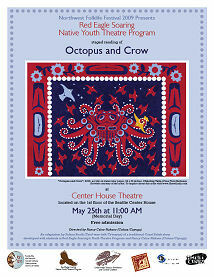 The painting of Octopus & Crow was later used to promote a play created by Native Youth on smoking cessation. May thanks goes to Steve Charles and Johnny Mayo for all their tireless efforts! This was such an honor.